At Fred Simmons' Tae Kwon Do Studio, boys are turned into black belts and suburbanites into great warriors. That is, until Simmons' perfect life starts collapsing when he discovers his wife having an affair on him. Twice. A chance to resurrect his life by battling his hero - martial arts celebrity, Chuck "The Truck" Wallace - gives Simmons new purpose as he winds up on a wild, comic journey that takes him from egomaniacal bluster all the way to becoming the stand-up man of his delusional dreams. $36.391 thousand on 4 screens. Over the summer of 2008, Danny McBride became hailed as the next breakout comedy star. He played supporting roles in the hits Pineapple Express and Tropic Thunder, but he also got a lead via The Foot Fist Way. 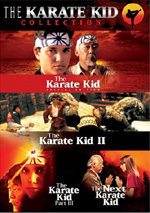 In Way, McBride plays Fred Simmons, a Tae Kwon Do instructor who runs his own dojo in a mini-mall. His life revolves around Tae Kwon Do, though he maintains a not-so-hot relationship with his blonde bimbo wife Suzie (Mary Jane Bostic). This goes deeper in the dumper when Suzie cheats on him and causes a bigger rift. Though he feigns a façade of strength, Fred goes into a downward spiral and starts to lose control. All that remains for him is his obsession with his martial arts idol, Chuck “The Truck” Wallace (Ben Best). The flick follows Fred’s journey in these various areas. As I alluded at the start, McBride received a lot of notice as comedy’s Next Big Thing. I’m not sure the public noticed, though. He did appear in the two hits I mentioned, but I didn’t notice a groundswell of praise from the average viewer, and Way didn’t get a lot of popular attention either. Maybe McBride will become a star in his own right, but I gotta admit I don’t see his appeal. He strikes me as a lout without any particular talent. Since a lot of people I respect view him as a fine performer, I’ve been willing to give him the benefit of the doubt, but this is the third time I’ve seen him in a flick, and I just can’t find anything noteworthy in his work. Because he appears in virtually every scene, Way could have become McBride’s breakout piece, but unfortunately, it just accentuates his deficits. He makes Fred a self-absorbed, abrasive dimwit with nothing much to him beyond that. The role lacks dimensionality, which wouldn’t be so bad if McBride could generate any actual humor. He can’t, and the movie as a whole follows that same witless path. 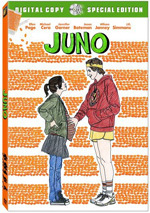 On the DVD’s cover, a blurb claims the flick is so “hilarious you’ll laugh helplessly”. Seriously? I didn’t laugh once during this tepid snoozefest. Indeed, I never even cracked a smile, as the film failed to provide anything that remotely smacked of humor. Honestly, I can’t figure out what anyone would find amusing about Way. It relies on the usual gags related to dumb, arrogant characters like Fred, and we get more than our fair share of cheap slapstick. Who thinks it’s witty to show an old lady get beaten up in the practice ring? Add a real amateurish feel to the many reasons Way flops. At first I thought the director wanted it to be a “mockumentary”, but I soon realized that instead he just wasn’t very skilled at setting up shots. Most of the actors put out dull, lackluster turns. Perversely, these almost make McBride seem talented in that “in the land of the blind, the one-eyed man is king” way. But not really. Incessantly stupid and unfunny, absolutely nothing about Way satisfies. The movie just rambles along without any discernible point and leaves us bored. 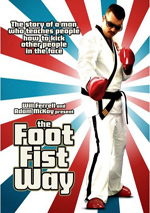 The Foot Fist Way appears in an aspect ratio of approximately 1.85:1 on this single-sided, double-layered DVD; the image has been enhanced for 16X9 televisions. A low-budget effort shot on 16mm film, the transfer showed its origins. Sharpness looked mediocre at best. Close-ups demonstrated decent delineation, but most of the movie came across as rather soft and fuzzy. No issues with jagged edges or shimmering occurred, and I noticed only minor edge enhancement. However, grain became very heavy throughout the flick, and I also noticed a few specks and nicks. Colors always remained bland. I guess the film featured a natural palette, but the hues were so flat and lifeless that it was tough to tell. Blacks were acceptably dark, and shadows were acceptable, though the grain made low-light shots murkier than they should’ve been. I expect that the transfer replicated the source material fairly well, but it remained too ugly for anything above a “D+”. While more impressive than the visuals, the Dolby Digital 5.1 soundtrack of Foot Fist Way was unexceptional. The soundfield largely focused on music. The songs and score boasted good stereo imaging and featured nice reinforcement from the surrounds. Otherwise the track remained quite uninspired. In terms of effects, the side and rear speakers offered light reinforcement, but that was it. I couldn’t identify a single moment that stood out as remotely memorable. A smattering of extras fill out the set. First comes an audio commentary with director Jody Hill, actor Danny McBride and production designer Randy Gambill. All three sit together for this running, screen-specific track. They look at cast and performances, sets and locations, stunts, visual design, influences and origins, working on a low budget, deleted scenes, and a few other production notes. Don’t expect a particularly winning chat. Occasionally the participants throw out some decent thoughts about the film’s creation, but not with much frequency. Instead, they often joke around, tell us what they like about the flick, or simply name actors. Fans of Way might find enough to keep them occupied, but the commentary didn’t do much for me. A Behind the Scenes Featurette runs 25 minutes, 13 seconds. In an unusual twist, the piece includes no interviews or narration. Instead, it simply consists of grainy, blurry black and white footage from the set. Edited in a rapid-fire manner and accompanied by cheesy music, we never get a feel for the production or see anything remotely interesting. A self-consciously arty piece, the featurette tells us and shows us nothing of even basic value, and it looks terrible. This utter waste of time stands as one of the worst DVD extras I’ve ever had the misfortune of watching. Next we find a collection of Bloopers. This two-minute and 12-second area splits into two clips: “Danny Laughs While On the Phone” and “Danny and Jody Laugh”. As those titles imply, these are just standard takes in which the participants make mistakes and giggle. Yawn. After this we get 20 Additional Scenes and an Alternate Ending. The former fill a total of 30 minutes, 51 seconds, while the “Alternate Ending” goes for one minute, 11 seconds. Since nothing funny pops up in the final film, should you expect anything entertaining here? Nope. Most of the clips just offer more lame gags, though a few minor plot points emerge as well; for instance, Mike gets a more proper introduction. The “Alternate Ending” offers a significantly darker twist to the flick, but not one that succeeds. A few ads open DVD One. We get clips for Defiance, The Love Guru, and American Teen. These also appear in the Previews area along with promos for Kenny Vs. Spenny and South Park Season 11. When a critic refers to a film as “the best thing of its kind since Napoleon Dynamite, I should know to run away as quickly as possible. The Foot Fist Way doesn’t actually bear a great resemblance to Dynamite, but it shares that stinker’s absolute lack of wit or cleverness. The DVD presents flawed visuals, acceptable audio, and some erratic extras. I can’t recommend this terrible movie.